Every businesses has a bumble beginning. 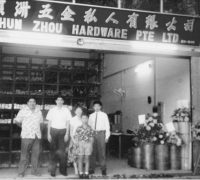 In 1988 Shun Zhou started her story in a little rented shop at the corner of King George’s Avenue, Singapore. Our primary business was to supply raw materials to the engineering workshops and some other small ship builders along Jalan Benaan Kapal and Tanjong Rhu where the Indoor Stadium is today. Growth was slow and we were not competitive as we did not have the means to hold high volume of inventory, buying from us was not cost efficient then as we were merely a small trading company with no track records. Nevertheless we did not give up, we strongly believed in our values which is always putting our staff and business partners interest above ours as we knew this virtue will enable us to garner faith and long term business relationships from them. Our perseverance paid off, 30 years on we still strongly believe that this golden rule has allows us to put business partners’ worries and doubts at ease, because we have proven ourselves with our track records and the affirmations by our business partners. Today, Shun Zhou Group is the most experienced, advanced and trusted one stop solution provider for the Marine and Off Shore industries that holds the most comprehensive inventory in South East Asia. In Shun Zhou Hub our main distribution center, we also have our own Robotic Fabrication Department(RFD) utilizing modern technologies to offer cost and speed efficiency to our customers and providing a greener and healthier environment to our staff. No words would be able to express our gratitude except a big “Thank you” for everyone that believes in us and love us. We appreciate your presence in our journey these 30 years and we want you to continue the journey with us for many more years.